Irish baby blessings are featured on plaques and signs along with plates and picture frames. This Irish baby blessing plaque features a hand painted message on a wooden sign that is enhanced with a shamrock. Sorry, this Irish baby blessing is temporarily out of stock. Irish baby photo frame features a blessing along with shamrocks and a lamb. This Irish blessing plaque pays homage toward babies and it is enhanced with shamrocks. This Irish blessing plaque for a baby features a Celtic cross along with shamrocks. Irish Christmas tree ornament is an angel with a child's blessing along with shamrocks. 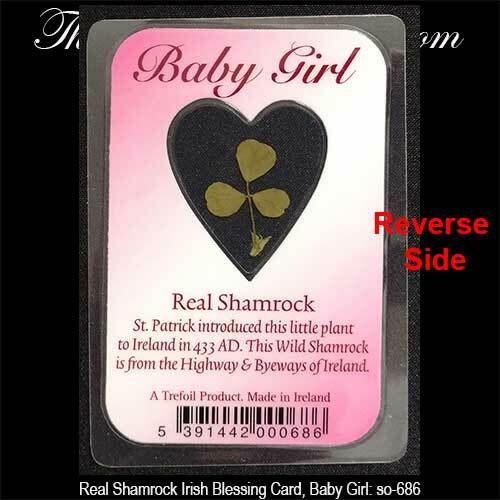 This Irish baby blessing card for a girl features a real shamrock. 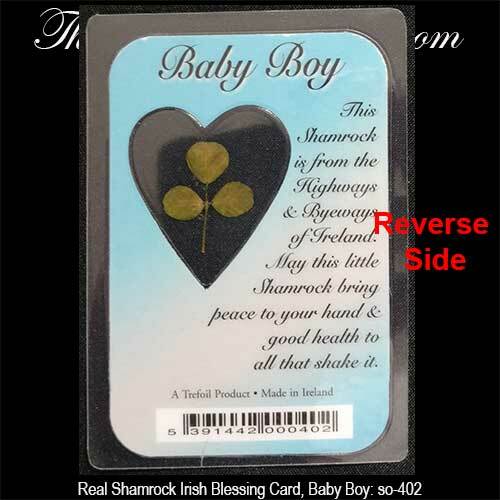 This Irish baby blessing card for a boy features a real shamrock.